How do you evolve a Pokemon that evolve by happiness in white? I trying to evolve my swadloon into leavnnay and my woobat into swoobat but, they both evolve by happiness. How do I evolve them if they evolve by happiness? P.S. I tried to cheer them up by entering them in the Pokemon musical and battling with them. I just wanted to say that you can check a Pokemon's happiness in Narcene City (girl to the right of the Poke Centre); this is how you can know if your Pokemon is close to its happiness quota for evolving. I tried that, I talked to her and she start talking about a wild audino. She says "Hi trainer! Do you know a Pokemon called Audino? Its a pokemon that I sometimes find when I'm walking. It jumps out of the rustling grass. I can get a lot of Exp. Points. It's kind a friendly pokemon, isn't it?" I did. Each time I talk to her, she kept talking about that wild Audino. By the way, the girl who tells you about Audino talks tells you happiness in black. I know because I have both black and white. 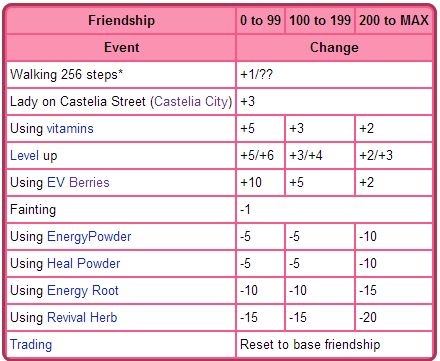 When happiness reaches a certain level (220), the Pokemon will evolve the next time it levels up. Or decrease. By the way, the woman isn't on Castelia street, but in the first building on the left. She will massage your Pokémon once a day. Try catching that Pokemon in a Luxury Ball. I already caught my swadloon and my woobat with pokeballs! take care of the Pokemon as you took care of it before it evolved. Can Pokemon that evolve by Happiness De-Evolve if treated badly? What level is normal for a Pichu to evolve by happiness? What is the average level for pokemon to evolve by happiness? In EOT, how do I evolve pokemon that normally evolve through happiness? How much more happiness do I need for riolu to evolve in white? Where can I find a guy that tells me what my happiness levels are? (black 2 & white 2)? How do you get all the Happiness berries in Black and White?